The Fellowes Quasar Wire is an ideal capacity machine for heavy duty office use. Stylish wire binding for a professional finish. Full width punch handle requires minimal effort for manual punching. Wire storage tray with patented document measure allows user to select quickly. Includes binding starter kit for 20 documents. Chip tray with burst out feature to eliminate jams. Vertical sheet loading ensures consistent punch alignment. Adjustable edge guide aligns sheets accurately. 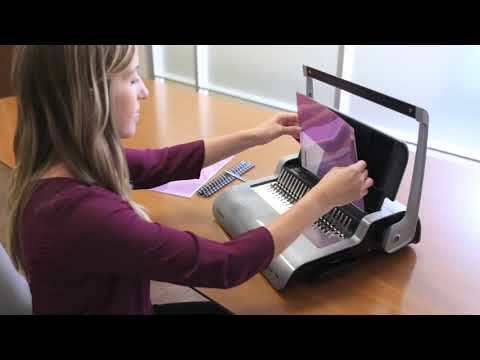 The Quasar Wire punches up to 15 sheets of paper at a time (80gsm) and binds up to 130 sheets with 14mm wire. Ideal capacity for heavy duty office use. Stylish wire binding for a professional finish. Full width punch handle requires minimal effort for manual punching. Wire storage tray with patented document measure allows user to select quickly. Includes binding starter kit for 20 documents. Chip tray with burst out feature to eliminate jams. Vertical sheet loading ensures consistent punch alignment. Adjustable edge guide aligns sheets accurately. 2 year warranty.